You are visitor number 758453. Each person can be represented in a 3D mental landscape. 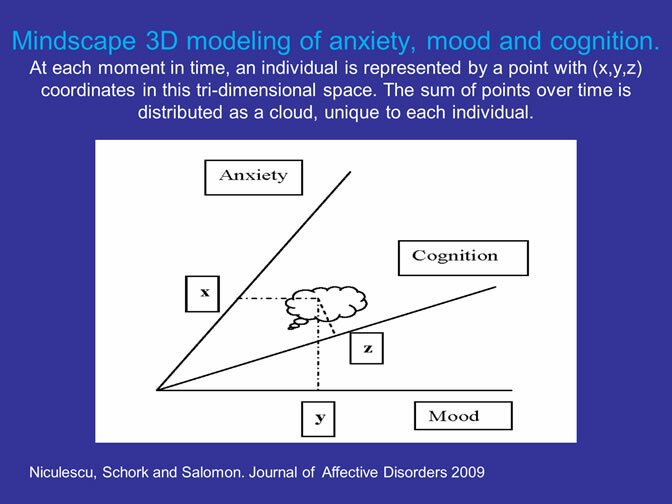 The three dimensions are mood, cognition and anxiety. Scores in each of the three dimensions will provide the GPS-like location in Mindscape (x, y, z coordinates) for each person at a particular moment in time. That would provide personalized information regarding a subjects’ state (how ill or how well they are at that particular moment). 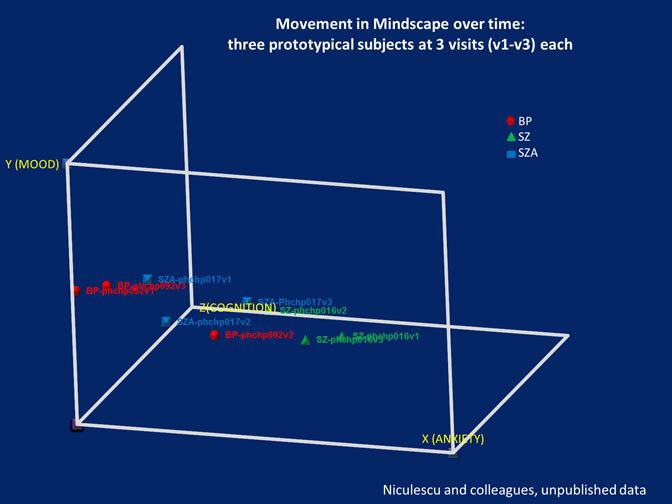 Repeated testing over time would provide a series of points in the 3D Mindscape for each subject. The cloud generated by this series of points, its’ shape and location would provide personalized information regarding a subjects’ trait (diagnosis). Starting with simple numbers from quantitative behavioral questionnaires first, then from biomarker blood panels, the scores on the three dimensions (anxiety, mood and cognition) can be developed over time to be more comprehensive, integrating a variety of behavioral, biomarker and genetic data. A single time-point testing can provide information related to disease state, biomarker levels, clinical severity. Repeated measures over time can provide information related to diagnostic traits, response to treatment, personalized diagnosis. Good clinicians currently use consensus diagnostic criteria and clinical intuition/ pattern recognition to approximately classify patients in what is the rough equivalent of different 3D Mindscape regions. For example, depression with psychotic features can be low mood, low cognition, and high anxiety. The game-changer in our ability to diagnose and treat people will occur when these operations are made explicit as opposed to implicit, objective as opposed to subjective, and quantitative as opposed to qualitative. 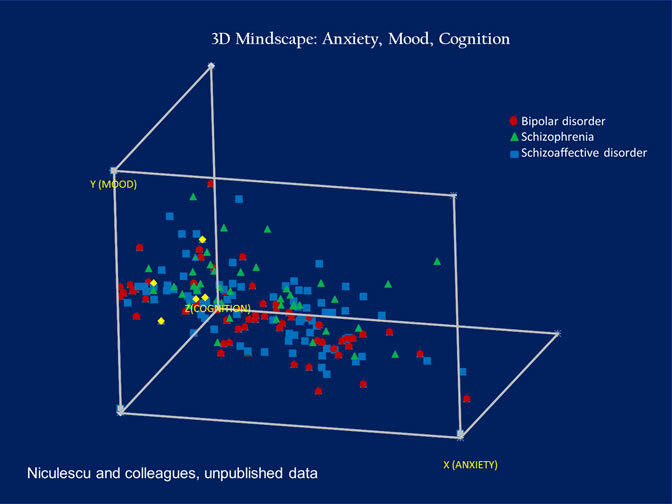 People who have extreme scores in the dimensions of the 3D Mindscape (outliers) are either clinically ill or super-performers. Within limits, finding the right environmental fit for different people may make the difference between needing clinical treatment and having a very productive life. When that is not enough, moving people in their 3D Mindscape with appropriate treatments will increase their congruence to the environment and ability to function well.